Ali launches one high and hansome over cow corner for six. Becoming a bit of a trademark shot for him that one. 10 from the over. 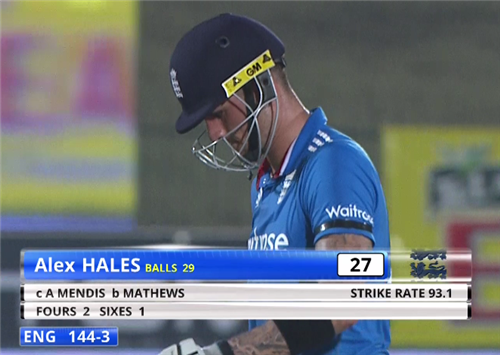 After being dropped and battering a six, Hales holes out to Ajantha Mendis at mid-on. Hales is given a life after his clip towards Thisara Perera’s paws is spilled. He makes something of that reprieve, too, by clubbing a six on the leg side – but departs shortly after. Bopara leaps above Morgan to enter the fray at No 5. Great work from Sangakkara, who reads Bopara’s sweep to catch the Essex star out. A first failure of the series for Ravi. England require less than 100 and they’ll get there quickly if Bopara wallops sixes like the one he has just pummeled down the ground. Damn! There goes that plan thanks to the pesky Sangakkara. Morgan’s next in and plays out Herath’s over sensibly. Morgan rolls out the hook shot – to poor effect. He skies Mathew’s slowie up into the gods and Perera snares the ball upon its descent.